ULI Winner for Best Public / Private Partnership – 25th Street Mixed Use Development - Marketing Specifics, Inc.
Congratulations to The Breeden Company for winning a recent Urban Land Institute award for Best Public/Private Partnership for the new residential apartment community called Aqua On 25th and iFLY Indoor Skydiving. We were honored to design the interiors for both projects. An innovative mixed-use development is changing the character of the Central Beach District and bringing value to the community beyond the beach. What was once a 244-space surface parking lot is now 147 residential apartments, a unique indoor skydiving facility and a public parking garage. 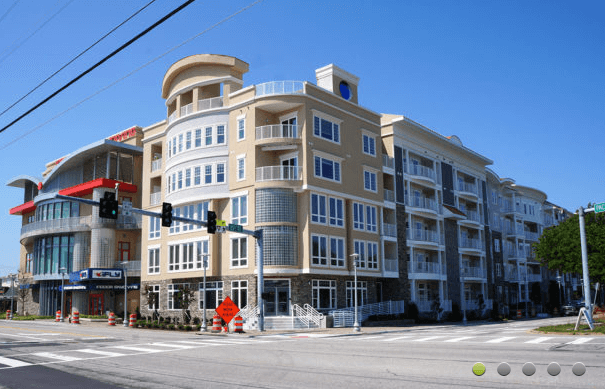 Beginning in 2011, The Breeden Company and the City of Virginia Beach partnered to find a home for proposed residential and entertainment uses. A municipal parking lot was identified and an innovative agreement was established which allowed the Breeden Company to purchase the site and develop it. Using a conveyance, the City purchased back the parking garage, the land, and leased residential parking spaces to the developer. Associated public streetscape and utility infrastructure costs were also shared.